The TBO Trifecta was founded by Three Belles Outfitters in 2016 as a way of promoting the sport of Kayak Fishing in the state of Connecticut. 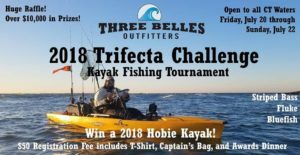 Sponsored by Three Belles Outfitters and the Hobie Cat Company, the Trifecta offers the opportunity to meet other anglers that share the same passion for saltwater kayak fishing. The 2018 TBO Trifecta Challenge is being operated by a committee consisting of TBO Fishing Team members, Three Belles Outfitters employees, and Three Belles Marina staff. The committee is open to accepting experienced anglers and kayakers who would be interested in promoting, planning, and assisting during the event.